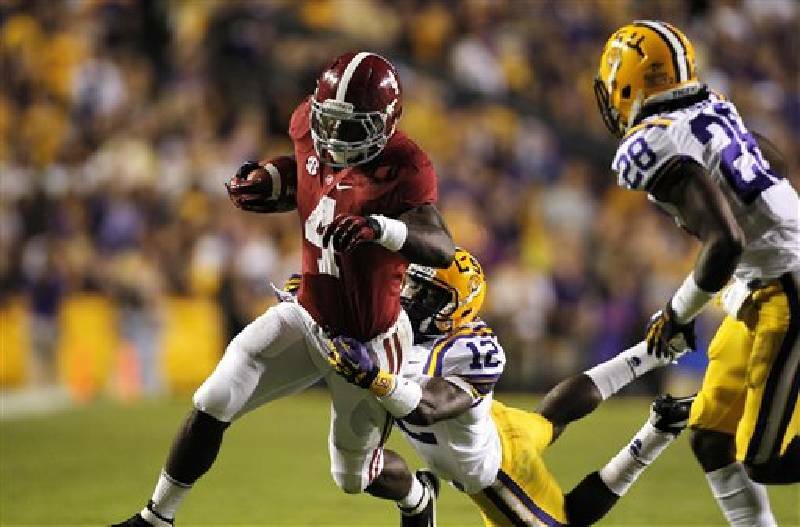 Alabama running back T.J. Yeldon (4) tries to break tackle from LSU safety Corey Thompson (12) in the second half of their NCAA college football game in Baton Rouge, La., Saturday, Nov. 3, 2012. Alabama won 21-17. Despite the thunderous reverberations late Saturday night inside Tiger Stadium, Alabama football coach Nick Saban was hearing things loud and clear. "Everybody was saying on the headset, 'I hope they pressure,'" Saban said, "and they blitzed." Countering LSU's surging defense, Alabama quarterback AJ McCarron lofted a screen pass to freshman tailback T.J. Yeldon, who raced 28 yards for a touchdown with 51 seconds left to propel the No. 1 Crimson Tide to a 21-17 victory. The Tigers trailed 14-3 at halftime but dominated the third and fourth quarters until McCarron delivered a stunning five-play, 72-yard drive. LSU amassed 435 yards on 85 plays compared to 331 yards on 52 plays for Alabama, which improved to 9-0 entering this week's visit from explosive Texas A&M. The Tigers, who host Mississippi State this week, would need Alabama to lose to the Aggies and to struggling Auburn in order to have any chance at a second consecutive SEC West title. "It's hard to finish second any time," Tigers coach Les Miles said of his 7-2 squad, "but the good news is that they gave everything they had and left their effort on the field. I'm proud of them. They're a hard-nosed group of men, and everybody told them that there was no way that they could win and that this was a mere formality. "I'm sick for my team, because they were very deserving of better." McCarron had completed just 10 of 22 passes for 93 yards before engineering the final march in which he went 4-for-5. He opened the ultimate drive with three completions to Kevin Norwood and then threw incomplete before finding Yeldon. "I just love moments like that," McCarron said. "I like having the ball in pressure situations. When you've got the teammates I have, it makes your job easy." Said Norwood: "The plays we were calling were for everybody. It just so happened that it worked out for me." McCarron's heroics overshadowed a brilliant performance by LSU counterpart Zach Mettenberger. Given little chance in the quarterback matchup, let alone against Alabama's vaunted defense, Mettenberger riddled the Tide for 24-of-35 passing for 298 yards and a touchdown. His yardage total was the most against Alabama since former Arkansas quarterback Ryan Mallett compiled 357 in 2010. "As well as I played, I would have traded three interceptions for the win," Mettenberger said. McCarron dropped to third nationally in efficiency (173.54) as a result of his challenging night, slipping behind Kansas State's Collin Klein (174.39) and Florida State's E.J. Manuel (174.03). The Crimson Tide continue to lead the nation in scoring defense (9.11 points per game) but are now second in total defense (228.9 yards a game) and rushing defense (66.3). They are eighth in passing defense (162.6). Saturday night marked the first time Alabama had trailed in the second half since losing 28-27 to Auburn in the 2010 regular-season finale. "There was a stretch in the second half when they converted seven straight third downs of five yards or more," Saban said. "We couldn't get them off the field, but we kept our poise and we kept playing and competing. I've never been prouder of a bunch of guys. I don't think we played our best game, and I thought they played an outstanding game. "That last drive was something I'll never forget."